"Think Different. ", the motto touted by Macintosh in their minimalist advertising campaign, has always lived deep in the heart of inventors, innovators and artists. When it comes to Macintosh, few people understand these words better than Yukio Tezuka, founder of McMobile Inc, a veritable mecca for Macintosh users, located in the Philadelphia suburb of Upper Darby, PA. The seed of McMobile was planted by Tezuka's early passion for invention and discovering how things work. At age nine, he built his first radio from parts of old broken down electronic gadgets his father brought home. Tezuka came to the US to attend graduate school at the University of Pennsylvania, where he earned his Masters of Architecture in their Urban Design Program. There, unbeknownst to him, a few extra credit courses would turn his fate in a new direction. One course was problem solving, the other computer programming. In the late 70s, the first personal computers were punch cards. Tezuka purchased one, the HP hand held calculator, which he found to be "a cool gadget". Next came the Commodore VIC 20 for word processing. 1983 brought the first graphical user interface (GUI), the Koala drawing tablet. The problem was, this didn't come with software to print. Now Tezuka had a challenge, to create software to print his drawings. His first programming effort took an hour and a half to print. Through investigation of computer language, he learned that assembly language was more specific than basic. His ongoing efforts finally yielded a successful print in thirty seconds. This impressed Commodores' RUN magazine, who paid him for his program and the accompanying article describing it. His interest in software programming continued, games mostly. Over time he found this too consuming and turned his attention to hardware and the ultimate sensibility of the graphical user interface. He drew an outline of just such an interface one month previous to Apples' introduction of the Macintosh. "They were ahead of me. ", says Tezuka. - Tezuka’s GUI was composed with on-screen grid system, each grid contains a program. This concept is very similar to iOS and Windows, believe it or not. If he continued, Commodore’s future could have been totally different. In 1984, one of the partners in the firm that employed him, who shared his openness to new technology, bought a 128K Mac. Tezuka was intrigued by its' intelligent design and ease of use, and immediately endeavored to find out "how and why" by taking it apart and determining the use of every single part. While maintaining his position at the firm, he continued to pursue his hobby, uncovering the workings of the Macintosh. As he carried his 30lb. Mac Plus back and forth to work every day, he pondered a way to make it smaller and lighter and McMobile was born. The mobile Mac (at that time Apple was fiercely possessive of the Mac name, Mc was the next best thing). Using the knowledge of marketing cost and advertising developed while working with his brother's company, OZ (who boasted clients such as Sony, Clarion, Sanyo), he set out to effectively create his prototype. After investigating parts and suppliers, he settled on the electro luminescent screen from Planner Systems. The manufacturer didn't think it would work with the Macintosh system. Undaunted, Tezuka still remembers the moment that familiar "welcome to macintosh" came up on his newly assembled invention. 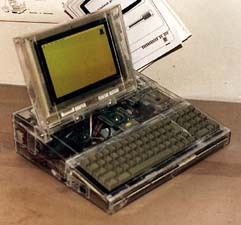 The first prototype was built from picture frame plexiglass and taken to the only authorized Mac dealer in the area. Everyone who saw it agreed, he had himself a diamond in the rough. He made a few more prototypes and raised money through a group of courageous investors. The goal, to create a portable, affordable upgrade from the early Mac models. The first run would be 100 units. Refining his selection he found a new LCD screen from Sharp. All systems were go and it looked like this was an idea who's time had come. The case was the final requirement (this alone was a $30,000 investment). Money changed hands and the case was in production. Or so he thought. Only to learn, months later, that the case maker had squandered the money on personal use. This delayed production just long enough for Apple to introduce their first portable Macintosh. Though his McMobile portable did not make a splash, close to the goal of 100 units were sold over time. Mostly through mail order, with the addition of an accelerator card. Tezuka's inside/out knowledge of Macintosh, and PC systems, made him the problem solver at his office. Through his comparison of the two systems his new goal became "a Macintosh on every desk". This enthusiasm for Macs led to a side business selling, repairing and consulting. In 1990 McMobile was incorporated. It took six years, several attempts and finally a ten page letter to Apple explaining his vision to become Apple authorized. 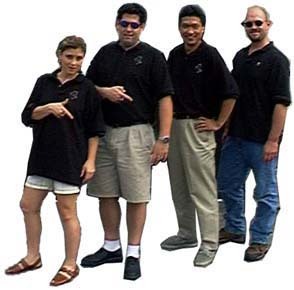 In 1996 McMobile committed to expansion through additional advertising, hiring a full time salesperson to assist customers, increasing its repair business and maintaining greater inventory. Today, McMobile is one of the only stores in the region dedicated solely to Macintosh. - There are now several Mac only stores, including Apple Stores. However, the original commitment to Mac is still strong at McMobile. If you have old Macs or if you have complicated needs, McMobile is the only place in the region. Why Macintosh? The Mac is elegant and efficient, because the Mac OS and hardware are engineered together. This integration makes the most of computer performance. PC hardware technology has not changed much since IBM's first machines. Windows software sits atop this hardware to direct it to emulate the Macs' built-in graphic interface. "Emulation, no matter how good it is, is still emulation; and from an engineers point of view, is not acceptable.”, says Tezuka. When problems occur with a WinTel machine, determining whether it is hardware or software related can be a long, arduous process. This is not the case with Macintosh. Though the Mac is easy to use, sometimes people still need help. McMobile offers free phone tech support. Within five minutes they can determine whether the user can solve their own problem. If not, they offer in-store, low-cost tech evaluation. The repairs are explained, the customer is not overcharged and the work is done in 24-48 hours. The once unhappy user comes away feeling 100% satisfied. Their Macs work and they have learned something in the process. What makes McMobile different is this intention to help users understand their computers. The desire to share his experience and knowledge in a "user friendly" atmosphere led Tezuka to christen McMobile the home of MacSensei, a Mac teacher or master. All employees are required to study the inner workings of the Mac and workshops are offered to the public on basic hardware, and software applications. There aren't many good computer stores, Mac or PC, where you can get straight, accurate answers. How many mail order houses or superstores are known for their support? None that I know of. McMobile is a place where small and big buyers can go for help. They believe in repair and upgrade and have tremendous deals on used systems. Many of their products have been chosen and tested for real value and usefulness to the customer. So, if you feel gratified by intelligent design, revel in your own uniqueness and are compelled to "think different" or if you just need a good inexpensive computer now you know who to call. Commentaries in italic were added in 2013.